Extension papers on dog welfare. Free downloads available. Description: Upon entering a kennel environment, dogs may be confronted with stressful situations, and some may experience fear, boredom, frustration or social isolation, which may result in poor welfare. This publication points out that knowledgeable caretakers can impact the health and well-being of dogs by identifying and attending to signs of poor as well as positive welfare states. Description: Canine brucellosis is a contagious disease affecting all breeds of dogs. Humans can become infected, too. 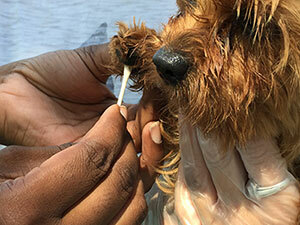 The disease represents a potential source of economic loss to breeding kennels. This publication focuses on the need for kennel managers and owners of dog breeding facilities to understand the disease and its implications for dog care and welfare. Description: Interest in improving the welfare of dogs maintained in kennel environments has resulted in debate about the scientific basis for current standards for housing dogs in the United States. The commercial dog breeding industry is widely criticized relative to dog welfare, and dogs' housing conditions often are a focal point. While much attention has focused on the genetic, health, behavioral, and psychological well-being of dogs in these operations, few studies have focused on the welfare implications of the flooring on which dogs are maintained. In this 4-page publication (PDF), the authors describe current information about the effects of flooring on kenneled dogs. Description: Environmental enrichment can stimulate captive dogs mentally and physically, reducing undesirable behaviors that may result from boredom and frustration. In this paper, Purdue University researchers discuss five types of enrichment that can be used to enhance an animal's quality of life. Description: This paper summarizes the history of the concept of pet overpopulation, evaluates the approaches used to manage the pet dog population and provides a basis for examining the concerns that have emerged due to widespread acceptance of the idea of pet overpopulation. 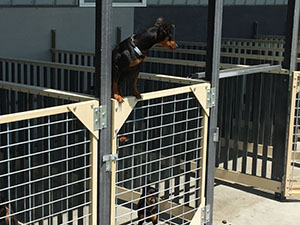 Description: Protecting the welfare of dogs in kennels requires consideration of their unique sensory and thermoregulatory capabilities. Because dogs and humans perceive environments very differently, it is important to ensure that dogs' housing environments are tailored to meet their needs, rather than the needs of their caretakers. In this 4-page publication (PDF), the authors describe the effects of noise, odor, temperature, humidity, ventilation, and lighting on kenneled dogs. Description: While it is critically important to meet dog's basic needs for food, water, shelter, and appropriate healthcare in any environment, dogs maintained long-term in kennels require substantially more than a balanced diet and a clean environment. Good animal welfare extends beyond basic biological functioning; we must assess the dog's environments comprehensively. Evaluating and protecting the welfare of kenneled dogs depends on our understanding of all their physical and behavioral needs. Ensuring that dog behavioral and psychological welfare needs are met is essential to providing an environment where dogs can thrive both inside and outside the kennel. This 3-page PDF publication explores current knowledge about dogs' needs for space in kennels. Description: Dogs in kennels don't always get the positive interaction they are used to, and that can have adverse consequences. Three Purdue University researchers say promoting bonding between dogs and caretakers has positive impacts for all involved. Description: The temperature of the environment in which domestic dogs are housed can have positive or negative effects on their well-being. Federal regulations listed under the Animal Welfare Act include clauses to protect animals from extreme temperatures, but they do not take into account dog preferences for temperature or the diversity of body shapes and types within the species that may result in varying levels of tolerance for different temperatures. Several factors determine the temperatures of dog experiences on any given day, and it is important to take them into consideration when evaluating dog housing and promoting dog welfare. Description: The prevalence and severity of dental disease in pet dogs is undertreated but well documented. Less is known about the effect on commercial breeding dogs. Two Purdue University experts explain how more research in that population can lead to further improvements in the health and welfare of all dogs. Description: Caretakers have an ethical obligation to provide the best possible housing environment for cats in their care. It's important to understand how to assess the well-being of cats kept even temporarily in cages. This paper discusses how keeping records of food intake, eliminations, social and active behaviors, and cage condition will provide valuable information in identifying cats are who and aren't adapting well. Description: Confinement is a certainty for millions of cats. But housing environments vary widely. This publication focuses on how daily routine and the cage environment enhances the welfare of caged cats through environmental management. Description: Caged cats must acclimate to environments with multiple stressors. The cage is often the focus, but caretakers must assess and manage aspects of the room as well. This publication addresses how the room environment — noise, odors, pheromones, temperature, etc. — can affect cat welfare. Description: Understanding consumers’ perceptions of animal welfare is becoming increasingly important to livestock industries as they try to communicate their products. Many questions arise within livestock agriculture when trying to implement production systems that are acceptable socially and financially. Description: This 4-page publication discusses where consumers are purchasing food, their sources of information on animal welfare, whether their household has been involved in food production, their perceptions of livestock operation growth, and their perceptions of the impact of livestock operations.